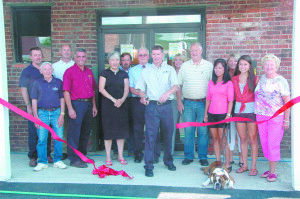 The community of Whitehall celebrated the opening of its newest business last Wednesday on a picturesque afternoon. The Whitehall Chamber of Commerce, along with the Town and Village of Whitehall, officially rolled out the welcome mats during a ribbon cutting ceremony at the new Warren Tire Service Center. Under a sea of blue skies, local business leaders, volunteer firefighters and politicians toured the inside of the historic building and exchanged pleasantries with employees and members of the Kellogg family, owners of Warren Tire. Once everyone was assembled, Bob Kellogg, president of Warren Tire, surrounded by family, prominent employees and local dignitaries cut a giant red ribbon stretched across the main entrance. He then shared a few words with those who had assembled. Town supervisor George Armstrong, Dana Grant, president of the Whitehall Chamber of Commerce, and Marge Mohn, representing the village board, all spoke briefly. The service center was abuzz of activity throughout the afternoon as a steady stream of cars poured into and out of the community’s newest business. Volunteers grilled hot dogs and handed out subs and pastries, the latter of which were donated by Stewart’s. Cat Country 105.3 played music and interviewed members of the company. Near the entrance, the Whitehall junior varsity and varsity soccer teams held a benefit car wash to raise money for Peace Week, an annual week-long event at the high school promoting tolerance and understanding. Their efforts were augmented by a $100 donation by Warren Tire. Don Mallory, branch manager, said the first two weeks since the garage opened have gone very well. The Whitehall service center is the company’s 16th location and Wayne Kellogg, owner, said he had been looking to build a place in Whitehall for some time when they came across the old train depot. Once purchased, contractors began the arduous task of transforming it into a serviceable garage. The entire interior of the building was gutted and new tile flooring and sheetrock was installed throughout. Outside, a new roof was installed, two bays were cut into the building’s façade, and two existing bays were reinforced. Throughout the entire process, pains were made to adhere to the building’s original character and old railroad spikes and coal found during the excavation are enclosed, along with a model train, in a glass cabinet. “We really wanted to emphasis that historic look,” Mallory said, adding he hopes to repaint the freight depot sign on the northern end of the building. The location is a complete auto service center employing four people—one manager, two technicians and a general mechanic—and carries the company’s full line of tires.